Yeah, but: It's actually a pill container. The Long Version: This is a handy little thing that solves a pretty major problem: carrying and keeping track of TTC tokens. They're about the size of dimes, cost $2.25, but are worth $2.75 - the current cash fare - each. So having them handy and secure is not a trivial task. Enter the Life Brand Pill Tote Key Ring. It has a 20mm inner diameter, which is just a touch larger than the size of the tokens, so it holds them without a lot of extra rattling. Twenty will fit in a nice neat stack, but even when the container is almost empty the plastic is quiet. It opens with three-quarters of a turn, and has an O-ring that will keep the contents dry. The jump ring is solid and it's not about to separate from the key ring and get lost. My only complaint is that the threads are fairly fine, and the container can be hard to close. A coarser thread would be easier to handle even if it needed another half-turn. I'm still surprised that there's no product specifically designed to hold TTC tokens, and don't know what other people do. 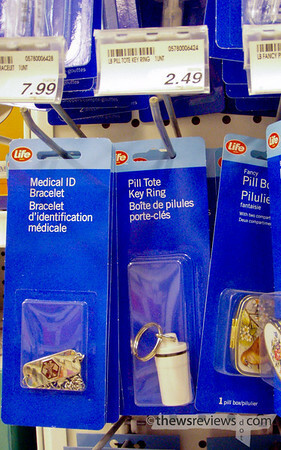 But the keychain pill fob costs less than three dollars, and it's easy to find in any Shopper's Drug Mart, which means anywhere in Toronto. It's hard to imagine anything working better than this already does, and it certainly wouldn't cost less. Well, I discovered who Ben Bockwell is. And you're right. there are token holders. they're cheaper than that pill tote. plus you don't have to mess around with a lid. and the tokens don't jingle. and it's flatter than that tote, so you don't have to wear it around your neck and it won't put a bulge in your pants. you can get them for $1.50 at the gateway store at the yonge-bloor subway station. so yeah, it costs less and works better. Even though I'm usually a Metropass user, I bought the Shopper's pill tote after seeing your review, to test it out. Until recently that same plastic tote has been attached to my keys, using a faux 'carabinier' clip. I usually kept a few tokens in it, for those times when I lend my pass or someone needs TTC fare. The plastic pill tote unexpectedly opened twice; the bottom falling to the ground -- but luckily all the tokens stayed inside (I think). I have been unable to locate the maker of these plastic containers but found a store selling similar pill totes in metal for $1.99. The design is almost the same size and I have been trying one out for several weeks. Just today I started to jog down the street and the jangling prompted me to check it and tighten the lid. About a block later the bottom fell and I hope there was just one token in it, cuz that’s all I found on the sidewalk. I like the product, but would add the proviso that users check it periodically and screw it closed completely, every time. **Disclosure: After exhorting the TTC and/or the private sector to make token holders more available to transit riders, I finally decided to do it myself, locating the makers of various related products and registering a sole-proprietor business to market them. Ed, thanks very much for the comment. I really appreciate that you took the time to try this idea out, and then came back to add your thoughts on the subject, especially since they're different from my own experience. My original pill tote is still in use and has never let me down, but I also use it on a regular basis - at least a couple of times a week. So for occasional users, I'd absolutely endorse periodic checks to ensure that the container is tight against the o-ring; perhaps even a small piece of tape across the joint to keep it from turning would be in order. But perhaps the occasional token-user would also be better served by something smaller, so I'll keep an eye out for other options as well. Ed, the TTC certainly has a proud history of missing opportunities. I wish you tremendous success in your endeavour, and can't wait to see what you've found. By the way, the metal pill-tote I found at Metro Paradise, a large dollar/discount store on Yonge at King. The brand is Sabre, which appears to be a line from Avaco Imports, of St-Laurent, QC.